Please type your desired tags, e.g. Security, Biology, Physics, Genomics, Systems and Computational Biology, Systems Engineering, ChIP-seq, HiC, Rhetoric, structural dynamics, Inquiry, Experiential Education, Women’s History, British Literature, Translation, Continental Philosophy, and etc. Yuri Gartstein's research interests cover various aspects of theory and modeling of electronic, optical, transport and mechanical properties of novel and synthetic materials and structures, such as carbon nanotubes, organic solids, conjugated polymers, disordered molecular systems and unconventional superconductors. He is also interested in physics of devices on the basis of such materials, examples being organic light emitting diodes, solar cells and electromechanical actuators. A more recent addition to his interests is left-handed (negative refraction) materials. Among Yuri Gartstein's representative contributions are the work done in collaboration with M.J. Rice and E.M. Conwell on excitons, optical absorption and charge separation in conjugated polymers and on Monte Carlo simulations of high-field hopping transport and charge carrier injection in molecular systems that have been featured in the last edition of M. Pope's and C. Swenberg's monograph "Electronic Processes in Organic Crystals and Polymers." 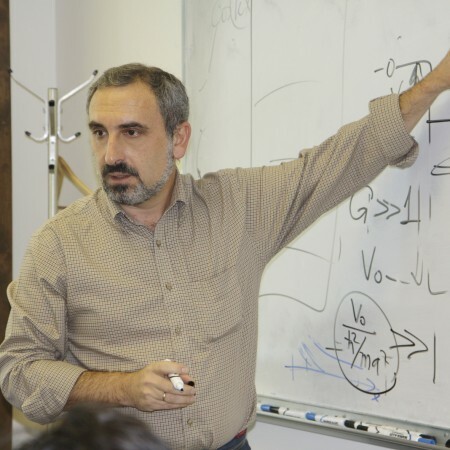 As a result of collaboration with scientists of UTD-NanoTech Institute, Yuri Gartstein's recent research has been geared towards physics of carbon nanotubes, which is exemplified here with the theory of electro-mechanical actuation in single-wall carbon nanotubes. Our study of charge-induced deformations of carbon nanotubes showed that deformations are anisotropic and strongly depend on the nanotube geometry, the latter represented in the illustrative figure by difference (N-M) of nanotube indices on the x-axis. The upper panel of the figure displays changes in the nanotube length per doping level, the middle panel shows changes in the nanotube radius, and the lower panel shows torsional shear. The conceptual insight achieved in our analytical analysis has been later confirmed by full-blown ab-initio calculations. As is transparent from the picture, the model predicted a much stronger longitudinal response for nanotubes of certain geometries (especially so called zig-zag tubes) making them potentially attractive candidates for (nano) actuators. At the same time, the model explains why enhanced actuation cannot be utilized until efficient separation of nanotubes of different geometries becomes experimentally feasible in the currently available bundles of nanotubes, the effect is averaged out. Chairman, Local Org. Committee, International Conference on Photonic, Excitonic, Spintronic Processes in Nanostructures, UTD, January 22-24, 2004.